It's time to start unwrapping the newest edition of our Legacy Family Tree software - version 8 - but just a little at a time. This will be the first of many articles showing some of Legacy's coming features. I'll start with some of the smaller features and work my way up to revealing the really cool new stuff. Today I'll begin by showing some of the main Legacy 8 screens, which have not changed a whole lot but when you see them, I am certain you will enjoy the refreshing look of the modern touches we have added. ...but we are still trying to decide which color scheme to go with. Which do you like, the "Vintage" color scheme above or the "Blues" color scheme below? Click here to cast your vote. Did you notice the new Ribbon at the top? We "stole" it from our Legacy Charting software that you have enjoyed so much. Now it is easier to find the right tools for the job. ...and really cleans up the interface. Did you also notice the new "4" and "5" buttons in the upper left of the Pedigree View. Now it is easier to change between displaying 4 or 5 generations at a time. That is certainly not everything new in these views. Those with really good eyes probably noticed the __________, the new __________, the new __________, and the new __________. I'll write about them in the articles to come. What else did you notice? So there you have it - some of the smaller of the new Legacy 8 features revealed. But to me, it's always been the small things in Legacy that have made me so happy. Please dont take away the lines in the persons view. (between name, birth, christening, death, burial , and also between the children - my eye sight is terrible, and I need the lines to keep the full overview! Other than that? I am looking forward to the new mondern look! Laila - all those lines are optional. Notice in the Blues design above they are there. In the Vintage design they are not. You're still able to have them or not. Diane - the smaller "updates" have always been free and the large "upgrades" (going to a new numbered version like v7 to v8) have always had discounted pricing for existing Deluxe customers. I think I like the Vintage design the most. Hope that stays as an option. Thanks for the preview, Geoff! I am looking forward to your upcoming posts. I like the Vintage color scheme better. I like both color scheams, but hope other color changes will be avaiable. I prefer the blue with the color gradient but without the shadow effect in the family view. To my eyes that seems to make it too much of a "busy" appearance. PS I couldn't connect to surveymonkey to vote with either Firefox or Explorer. Really like the new look! Looking forward to the new update! I like the Vintage color scheme better, but it would be nice to be able to switch. I like the vintage color scheme, it is easier on the eyes. I like the Blues colour scheme. It is not as bright and would be less likely to cause eye strain, to which I am susceptible. I love Legacy and have actually encouraged many of my students to get it. 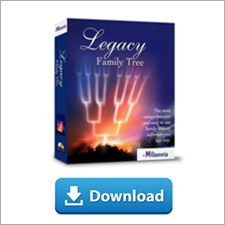 It is (in my opinion) the best software, especially for beginning genealogists. I am looking forward to the newest version. I like the Vintage colors the best. 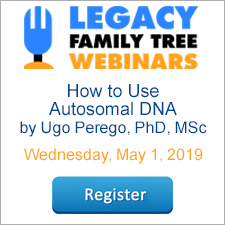 The big question I have is will it be Family Search certified with the Family Tree? New.familysearch.org is shutting down at the end of June and there will be no connection to family search after that. Anxiously awaiting news on when it will be certified but willing to jump ship if it doesn't happen soon or at least we don't get word when it is happening. I vote for Vintage, too. I agree with Laura .. it IS easier on the eyes. I hope that there will be a simpler way to sort children into age as not everyone gathers the data for the children in date of birth - just a little quirk, but anything to make life a little easier. Like both, but I think when doing hours of research the Vintage will be better. Also what is the 1/2 sign before Norman's name? I like the vintage--it seems almost every software package now comes in "basic blue" as the default...and sometimes only choice! I noticed that part of "Clean up" involved removing the quick access to the Tags. Thanks for continuing to improve the product and for giving the premium users a benefit. I think the new upgrade should be free to all those who purchased the Deluxe edition. You have always given us free updates before so please do not charge for Legacy 8 upgrade. Thank you all for your efforts. You are the best. I like the Vintage best also. I like the vintage look but the options appeal to me for sharing with others. I'm going to be different, I'm voting for "blue". It's easier to see for me. I think it's clearer. Love the program. Why do I have to pick between schemes? The current software allows me to conjure up any scheme I want. Ribbons are for Microsoft - most people - myself included - revolted at the change. Altho I have MS Office products on my machines, I usually use "traditional" software that doesn't require me to relearn how the read and write. OH, dear, against the grain again, I like the blues. I agree tho, make it so we can choose on the fly, or as our moods change. The problem with the blue idea is that it is the same as most "select" efforts. Won't this cause confusion for some of us with "mature" eyesight? I like the blue background as it allows the contrast to be sharper for these older eyes. How about having a choice between the blue and vintage backgrounds please? I would prefer to select my own colors. Would love to see some more. I agree with the others. The vintage look is easier on the eyes, but the blue looks kind of nice. Like the vintage better - seems easier on the eyes. Vintage gets my vote, but I have always liked the Legacy feature allowing one to select his/her own color schemes, hope that option remains. I'm anxious to see what the "big" changes could be because I've always thought Legacy had it all. This is the software I gave up TMG for and I've been using it since version 5. Version 7 has basically, with a little help from me, written and published two books. I don't see how it can get anybetter, but I'm eager to find out! I like the vintage, but agree that we should be able to choose other color schemes (as you can now). Please don't change the interface so much that we have to relearn the software (see FS and all their [daily] changes - arrgh!). I've used Legacy Deluxe for years, ever since I started doing genealogy on the computer, and I own all the add-ons - don't penalize us "old users" by making us pay full price (actually free would be better for those of us who've been customers forever). Y'all are absolutely the best - software, customer support, webinars, add-ons - you name it! The Vintage design seems easier for me to read and would definitely prefer to keep the lines in all views. I like the new pedigree view. Legacy is a fantastic program! Jason - we are turning in our FamilySearch software to FamilySearch this week for its certification application.